In a small bowl, combine the chicken, 3/4 cup picante sauce, cheese, 1/4 cup onions, cumin and oregano. Spoon 1/2 cup mixture down the center of each tortilla. Fold sides and ends over filling and roll up. Place seam side down in a 15-in. x 10-in. x 1-in. baking pan coated with cooking spray. Brush with butter. Bake, uncovered, at 375° for 20-25 minutes or until heated through. Top with remaining picante sauce and onions. To freeze, wrap chimichangas individually in foil. Transfer to a resealable plastic bag and freeze for up to 3 months. 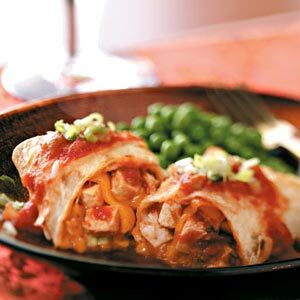 To use frozen chimichangas: Thaw in the refrigerator overnight. Remove from the refrigerator 30 minutes before baking. Unwrap foil and bake according to directions. Yield: 6 servings. WEIGHT WATCHERS and PointsPlus are the registered trademarks of Weight Watchers International, Inc. Trademarks used under license by WeightWatchers.com, Inc. © 2012 Weight Watchers International, Inc. © 2012 WeightWatchers.com, Inc. All rights reserved. People following the Weight Watchers plan can expect to lose 1-2 pounds per week.